The MasterTemp is certified for Low Nox emission. GAS Pool Heaters – Discover quality alternative heating options to be sure that Gas Heating is the right choice for your pool… Were you aware propane or natural gas has the highest operating cost, and is the least efficient / cost effective way to heat a pool? If you require rapid heat up, constant temperature regardless of outside temperature, or you are heating a spa or hot tub, then the gas heater below may be right for you. 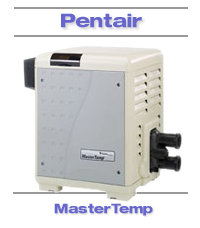 MasterTemp – manufactured by Pentair, now offers the most advanced heater available!!! The Energy SuperMarket offers the lowest on-line factory direct pricing available! Guaranteed. Pentair – A global technology and development company - Pentair is now the premier manufacturer of swimming pool and spa systems, and a world leader in water technology. MasterTemp delivers progressive advances in energy efficiency, smart electronics and innovative design. Its specially designed fueling and ignition process warms pool water faster to that oh-so-right temperature. Best-in-class efficiency – MasterTemp maintains a superior energy efficiency rating to keep annual utility costs at a minimum. Eco-friendly – Certified for low NOx emissions, the MasterTemp outperforms industry standards. Forever rustproof – A tough Dura-Glas exterior handles the heat and weathers the elements. User-friendly controls – The top-mounted, large format digital display allows for easy viewing and rotates to six positions for easier operation. Self-diagnostics – Ultra user-friendly indicator lights pinpoint heater and system conditions. Jump into savings and warmer pool water with the new MasterTemp pool heater. Gas Connections - Actual hook-up of the gas connections and the turn-on of the gas itself are highly recommend, and in most states legally required, to be performed by a licensed and insured plumber, or a gas utility company employee. Critical Warning - Do not attempt to connect gas lines or turn-on gas yourself! Serious personal injury, damage to the unit and/or home, fire, or explosion could result !!! Indoor installation requires Indoor Draft Hood. Use in high wind areas requires a High Wind Stack. Delivery truck driver will require handling assistance to be provided by purchaser when unloading unit from truck. Liftgate service, where available, may require an additional fee payable directly to the freight company. Compare energy efficiency ratings and you’ll find MasterTemp at the top of the list. Comfort and economy can go together. system. Plus, user-friendly indicator lights make system operation and monitoring a snap. MasterTemp is engineered for super-quiet operation and won’t intrude on your poolside leisure time. Safe operation is assured through a series of features, including; a water pressure switch that senses the pump is running to prevent overheating; high limit switches assure the heater turns off if water temperature exceeds factory set limits; manual gas shut-off when service is required; stack flue sensor also guards against overheating.